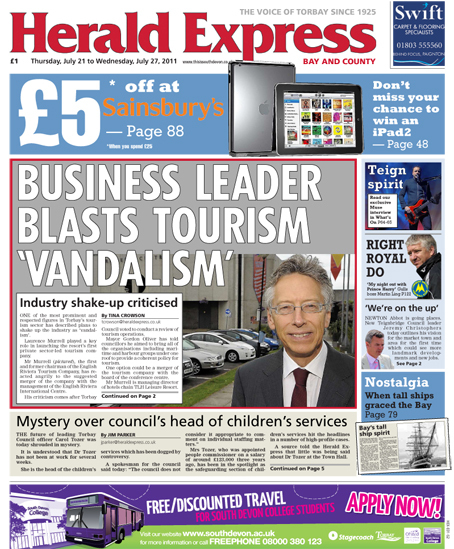 A new era dawned for the Torquay Herald Express today as it published its first weekly edition after 86 years as a daily. The South Devon title is the first of what is expected to be up to four Northcliffe-owned dailies to make the switch to weekly publication following a portfolio review by new managing director Steve Auckland. Around half of the 32 journalists’ jobs on the title have been axed ahead of the weekly relaunch. Said Andy: “It’s obviously early days but so far the response is very positive. We have a 192-page newspaper out on the stands with a major merchandising effort going on. “We’ve facelifted the design, which seems to be well-received – the watchword there was to ensure it was still recognisably the Herald Express, and we took a similar approach with content. “We know the readers liked the daily, the comparatively strong circulation performance showed that, so lots of familiar names, faces and features are there. Mr Auckland added: “The transition of the Herald Express from daily to weekly, as part of the wide-ranging review of Northcliffe Media, has exceeded all our expectations. “The advertising performance for this first paper was up 19pc from an average full week of daily figures and morale in the Torquay centre is really high. The last daily edition of the Herald Express, which had an average daily circulation of 21,112 according to the most recent ABC figures, was published last Friday. Next month will see the Scunthorpe Telegraph switching from daily to weekly, with possibly two more Northcliffe titles to follow. Given this is, supposedly, the start of a bright new dawn, I’d rather assumed the Herald Express would be pulling out all the stops to impress. I can’t comment on the story itself as it’s too small to read – though the headlines suggest it’s hardly the most of exciting of splashes – but the ‘facelifted’ design is there for all to see and, clearly, it’s a complete and utter shambles. More Bride of Wildenstein than Megan Fox! Can anyone [and that includes the editor, Andy Phelan, if he’s reading this] tell me what the hell is going on with the image accompanying the splash… was it intended to be a cutout? Was it meant to fill the entire box bounded by the red line ’cause, surely to God, it wasn’t meant to look like that! Use a few less different fonts and point sizes in the aforementioned stick. I dearly hope the 192 pager weekly works out and the circulation at least matches the 21,000 plus sold as a daily. It is the sacked journalists I feel sorry for – and the “half” staff left to provide copy and sub such monster-sized editions ! If he’s ‘blasting’ tourism vandalism – -why is he grinning like a halfwit? Was this the only pic in the archive they had or does a brand spanking new revamped daily-now-weekly need a smiling face on the front to ensure that everything in the garden is rosey? It’s all far too crowded and messy. Just too much on the page for the reader to take in. Pity because going weekly could work. Daily (morning) papers all look so tired now because websites, radio, and local tv usually beat them to the good-selling stories. Only excellent sports coverage in some cases is keeping them going.